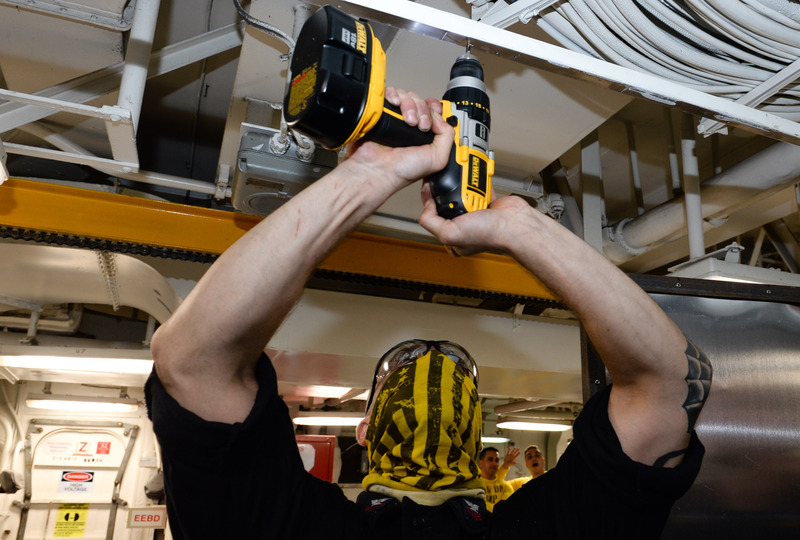 SURIGAO STRAIT– The Sailors that transit the 2nd deck aboard the aircraft carrier USS Nimitz (CVN 68) may have noticed the aft mess deck’s newest feature; a wall. According to the dictionary, a wall is defined as a continuous vertical brick or stone structure that enclose or divides an area of land. In this case it’s a series of wobbly metal sheets that encloses various rows of tables and condiments from the rest of the mess decks aboard the ship. Nevertheless, a wall, no matter how large, fancy or secure, implies a division. On June 26, Nimitz’ First Class Petty Officer Association (FCPOA) came together to reinstall the walls that enclose the first class mess aboard Nimitz, something that has been missing since 2013 before the ship entered the yards. What may seem like something that would disconnect Sailors actually aims to bring them together. “Some of the junior Sailors are going to look at the walls and see it as an ‘us vs. them’ type of thing, which it is not,” said Yeoman 1st Class Kelli Bradshaw, a native of Waxahachie, Texas and secretary of Nimitz’ FCPOA. The point of putting the walls up is to give the first classes a place of their own to conduct meetings, hold trainings and work together without the eyes and ears of junior and or senior Sailors. Aboard any ship, there are chiefs that serve as the barrier for everything that comes from the upper chain of command, the E-5 and below that are working and trying to figure everything out and then there are the first classes. First classes fill a role in which they are responsible to the Sailors below them as much as they are to those above them. They must provide guidance and technical advice to those that work for them, while supporting and achieving the standards that their superiors expect from their work center. The mess allows the members to discuss things like requests from the Command Master Chief, shipboard events, training opportunities and warfare training rodeos. They are responsible for enabling Sailors to get qualified and learn and abide by military customs, courtesies and traditions, uniform regulations, and policy procedures. The mess space aims to give them an opportunity to figure out how to do those things while working together to build on their own leadership skills. First classes from across the ship came out to help, to include those from the squadrons, Marines and Carrier Strike Group 11. “I think everyone is really motivated and excited about our new space. Everyone stepped up to build it and it all got done in two days,” said Bradshaw. Bradshaw said that putting up the wall together was a good start to the unity that the first class mess is striving to achieve that will help them serve the ship and its junior Sailors.